Stan Mauldin was an outstanding player at Amarillo in 1938, he went on to the University of Texas where he was an All-Southwest Conference tackle in 1942. 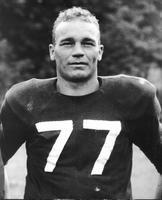 He played on some outstanding service teams, then went to the Chicago Cardinals in pro football. He died following a game in 1948 and his plaque will be presented to Stan Mauldin Jr.